A sea of lepers. Beggars. The frail and infirm. The hopeless and destitute. Long contorted faces, pitiful and crying out in longing. They crowd the damp basement room in the tenement where El Misterioso has arrived. He looks over his shoulder, both ways, smoothes his mustache. He is nervous. “Amigos, gather ‘round, we haven’t much time,” he says. His voice is softer than people expected. Gentler. He is not from this barrio. He is not a resident of these tenements. But it all right with them, he is their redeemer. Some whisper that he is Jesus, risen again. This is not true. He is a former college professor, and he is doing the best he can with what he has been given. His Atomic Suit starts to glow as he receives his first patient. El Misterioso looks at the mottled skin of this man dressed in rags and frowns slightly. Not out of disgust or pity, but out of sadness, and a tired sort of anger. They did this. The textile companies. One in particular. They are poisoning the people, and all he can do is help them, one by one. El Misterioso hugs his patient, gives his back a brotherly swipe. He is not Jesus, but if someone were to witness the gesture through an electron microscope, they would be seeing something that has never been seen in two thousand years. The cells mutating, turning from a craggy gray to a robust green, from sick to healthy, the cancer dissipating outward, into the blood, then breaking down further as they pass through the skin, and then disappearing altogether on contact with air. The tired man in rags looks at El Misterioso: the faint understanding that he is well now begins to color his face. He is a long way from smiling, but he is well now, and he is ready to go back to his family. Next is a hunched little old woman, huddled with a little brown boy behind her shawl. Her gray hair is pulled back in a tight bun. Her wrinkles are worn deep creases in shiny dark skin. She pushes the boy forward and motions at El Misterioso. She doesn’t speak much Spanish, she is Indian, El Misterioso nods and receives the boy, his hands gripping the boy’s shoulders. The boy isn’t afraid, he just sees a kind, rosy-cheeked man in an amazing suit, and he stares in wonder. “So, you have the Sickness too, eh, boy?” El Misterioso gives his shoulders a squeeze and tousles his hair. “There. Be well. And take care of your grandmother.” The old lady steps forward now. She is holding something else. El Misterioso looks down. His face goes pale. She holds out to him a bouquet of flowers: red poppies, bundled with sprigs of coca leaves. He knows these flowers. Not just the kind, but the provenance. He looks at the old Indian woman, but she is timid. Someone is sending him a message. Someone has found out how El Misterioso is making his living. He accepts the bouquet and puts them to his nose. These are not flowers he has fixed, he senses. He closes his eyes and blows on the flowers gently. Nothing seems to happen, but he knows the poppies are now rendered useless, at the molecular level, for opium production. The coca leaves are useless for cocaine, and will not react chemically with their processes. A symbolic effort, since this is just one bouquet. He sighs. When the Atomic Suit came to him, he was a full professor in the chemical engineering department at UNAM. He became an instant celebrity. Talk shows, then meetings with government officials, both here in Mexico and elsewhere. The lecture circuit paid handsomely for a while. But people were after him. After the suit. The meetings with governments became more furtive, the requests for talks came in the shadow of night, for groups that were not as public as those to which he was once invited. Then the threats. First from the textile companies—one in particular—and also from the government goons. The military sent its own people out too, eventually, to try to retrieve the suit. El Misterioso went into hiding. He is not a genius, but he is a clever man. The idea for the flower business was as close to genius as he’s come. In his running, he came upon a field of poppies being cultivated for heroin production. It wasn’t his business, but it saddened him all the same. He knew the powers the Atomic Suit afforded him, he knew what effect it had on people. But he hadn’t tested it on other living matter yet. He wandered into the field of poppies, arms outstretched, his fingertips tickled the round buds with their coveted sap. The sap paled and turned sweet (he licked his fingers to try to discern the subtle changes). The flowers were beautiful, and now they would not hurt anyone. It was a simple matter to come back a month later to the now-abandoned field and establish himself as proprietor of a new flower business. Other fields would follow, and soon El Misterioso had his own major corporation. None knew he was behind it, of course. He kept several protective legal shells between him and his source of income. But the drug lords, they knew something was amiss. How could they not? Many of their fields suddenly stop yielding, completely. They were feeling pinched, and they needed to root out the cause and neutralize it before another season went by at such diminished capacity. But El Misterioso remained elusive for a long, long time. With that income, he could stay below the radar. He could afford to operate more freely. So long as the drug lords didn’t discover him, he was able to pursue his goal: eliminate the leaders of the textile industry—one company in particular—that was using deadly chemical compounds in their sweatshops. He knew all about it. He invented the worst one. He had created the compound that, when released into the air, would work its threefold magic: it was meant to be an antidepressant and acted as a contraceptive—pregnant workers meant more paid leave, and the poor girls they hired were always getting pregnant—and the coup de grace, the compound, when it settled in the fibers of the clothing being manufactured, made the cloth unusually resistant to dirt and stains. In a short time, he had destroyed the labs that supplied several of the smaller corporations with this compound, a patented and inferior version of his own that had nonetheless proven toxic. He was now ready to go after one company in particular. The worst one, the company that had taken his compound and added addictive elements to keep the workers coming back, and new workers applying in record numbers. Wages were depressed, workers were sick and mindless, and now a new sort of cancer was spreading throughout the country. One that was going misdiagnosed and untreated. Especially since the textile industry—one company in particular—was now funding the bulk of cancer research in Mexico. And he who controls the purse strings controls where the gaze of scientific inquiry looks. And it certainly wasn’t looking at the epidemic of sick garment workers. Sick and dying workers were shown the door: there were many new applicants willing to work at the great company that looked so well after its employees. A great company with a dangerous enemy. But the game of cat and mouse had just reached a new level. El Misterioso looks at the bouquet and tucks them inside his Atomic Suit. The glow seems more fierce now, and the crowd surrounding him looks at him with long droopy eyes. “I am sorry, my friends, I must go. Quickly now, come, gather around closely, that’s it—“ He brings them all together into a tight huddle, El Misterioso at the center. we raises his arms in a T and touches each of their heads, spinning slowly until he is sure he has touched them all. they are all murmuring and swooning, so they don’t hear the boots in the street below. They don’t pay attention to the boots marching down the stairwell. But he does. Something tugs at the hem of his glowing jacket. It is the old Indian woman. She looks up at him pleadingly. “ZapoTextl,” she murmurs urgently. She has heard them too. But he cannot take her with him. Nor her grandson. El Misterioso stands, arms to the heavens, as armored paramilitary goons burst in, armed to the teeth with gas weapons and grenades and automatic rifles. 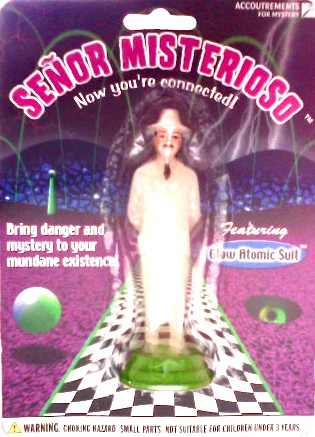 There is a flash, the people cower, and El Misterioso is vanished. But not gone. He is still there, a cloud of invisible atomic dust, working its way quickly around the room. As a dust he is more pervasive. He surrounds each goon. He enters their skin through the fabric of their clothing, through their pores, through their nostrils. He invades their cells and quickly works his powers. The cells, healthy and strong, now mutate and go gray. The blood vessels stretch, wither, and shred, starting at the capillaries—the goons quickly drop their weapons—then up the veins and, very quickly, into the heart and arteries. The goons stagger to their feet, clutching at their chests. It’s the only thing they know to clutch, since really it is their entire bodies that are writhing in a burning, entropic pain. Within moments, their faces are gray leather, frozen in soundless howls. They have shriveled inside their armor and clothing. They are dead, or close enough to death as to be rendered harmless to the people before them, now looking up in amazement, feeling and appreciating the blood and life coursing through their own bodies. No one sees El Misterioso leave. Now, several blocks away, he emerges from the shadow of a doorframe into the streetlamp-lit alley. He rolls a cigar from left to right in his mouth as he adjusts his fedora. The glow of his Atomic Suit has dimmed to a bright white. He steps out into the street, and heads on foot toward Paseo de la Reforma and the headquarters of ZapoTextl and its leader, Manuel Heliotropa, better known in the underworld as Isótopo.